I'm so happy I have friends who throw a Halloween party here in KC. I haven't dressed up in four years so I took this opportunity to get crafty and make myself a costume. As for ideas, I knew I wanted to be a food item. 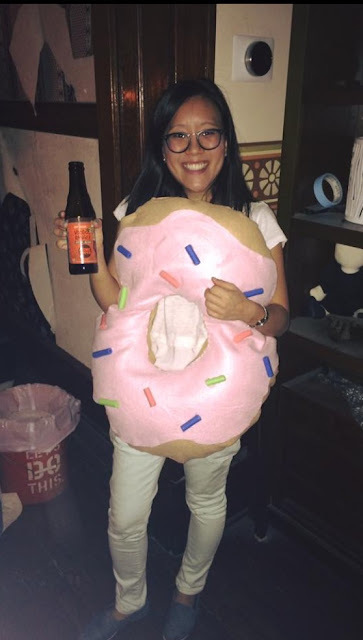 And since I already dressed up as a cupcake, I went with a donut this year (my other love). I scoured the internet for a no-sew costume and found this cute tutorial. I suppose I could have also purchased one since I found one in the aisles of Target the other day. For some reason, I didn't own a hot glue gun prior to making this and thought making this costume would be fine with fabric glue. Oh my god, what a headache and for some reason I powered through until I had to glue on the sprinkles. I even resorted to sewing before buying a hot glue gun---I guess I was stubborn and wanted to just try to make it work. Don't be like me, use a hot glue gun. They're amazing and you'll have a spiffy donut costume in no time. 1. Fold the light brown felt in half. Place the hula hoop onto the felt and with the permanent maker, trace a circle with the outer edge of the hula hoop. In the middle of the circle, trace a smaller circle with a small bowl. Cut the circles. 2. On the pink felt, trace a circle with the inner circle of the hula hoop. Then draw a scalloped edge circle inside the circle. 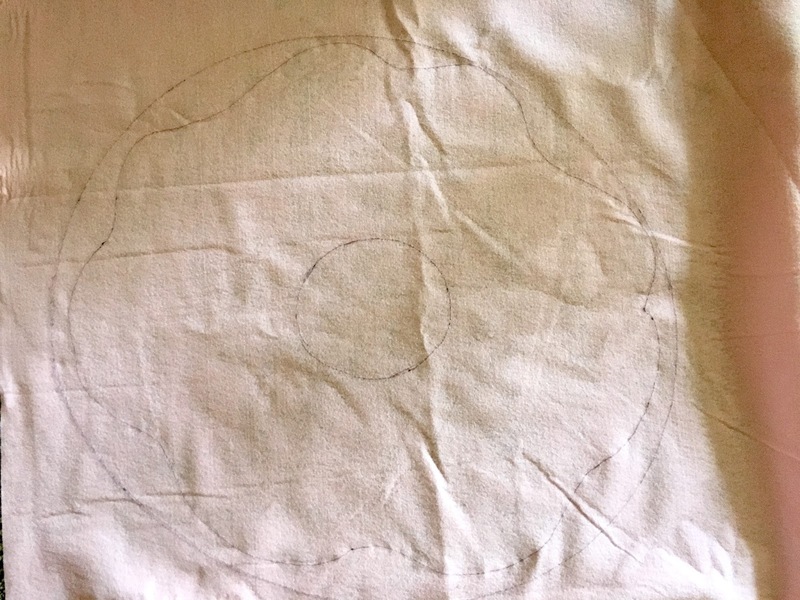 In the middle of the circle, trace a smaller circle with the small bowl. Then cut out the scalloped edge circle and smaller circle. 3. Hot glue gun the outer edges of the brown felt circles by folding in the one centimeter of the felt and glue the folded parts together. (I stapled the edges closed to create a tighter seal since I didn't totally trust the glue). When half of the circle is glued, stuff the donut with the fiber fill. Then continue gluing/stapling the donut closed. Do not glue the smaller, inner circle yet. 4. Line up the pink felt with the donut at the "donut hole." Then glue the pink felt (frosting) onto the brown felt. 5. Glue the donut hole circle closed just as you did for the brown felt. (I ended up sewing this closed with my terrible sewing skills because it was kind of hard to glue it closed since I didn't have my hot glue gun yet). 6. Cut up foam hair rollers. The ones I linked above have a wire in the middle, so remove the wire before cutting. 7. 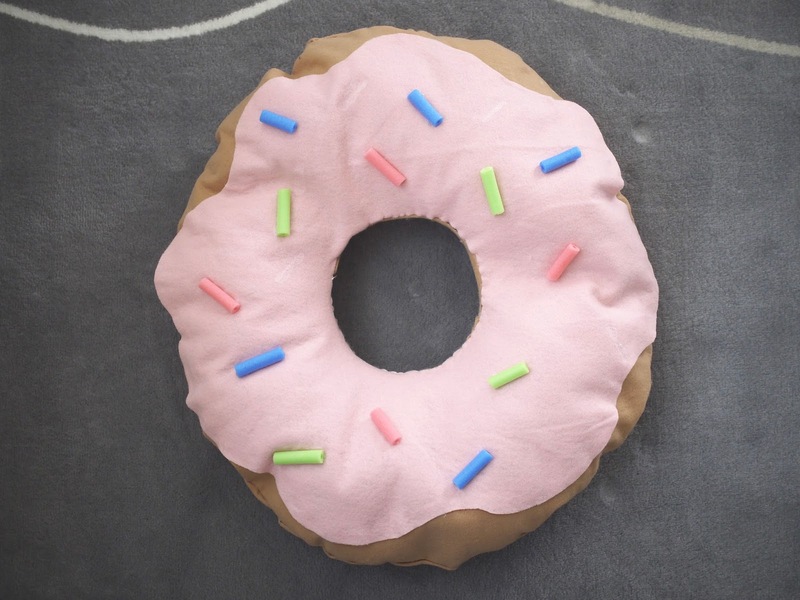 Glue foam hair rollers onto the donut for sprinkles. 8. Cut long straps of the elastic for arm straps. 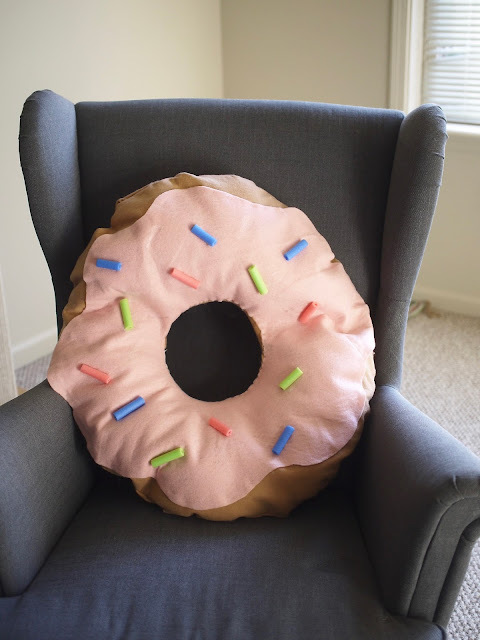 Attach on the back of the donut with safety pins or hot glue onto donut.